Supported by Technology and Innovation Action Plan of Science and Technology Commission of Shanghai Municipality (16142203100, 18142201600) and Youth Project of Shanghai Municipal Commission of Health and Family Planning (20154Y0112). Abstract: Objective To measure the renal volume of polycystic kidney disease rats using low field magnetic resonance imaging (MRI), and to explore its application value in the basic research of polycystic kidney disease. Methods Fifteen Han:SPRD rats with polycystic kidney disease of different ages were subjected to anesthesia, and the kidney volume was measured using low field MRI. The kidney profile was delineated by engineers and clinicians. The imaging method was T1-weighted imaging. The cross section of the kidney was imaged, and the kidney volume was calculated using image processing software. 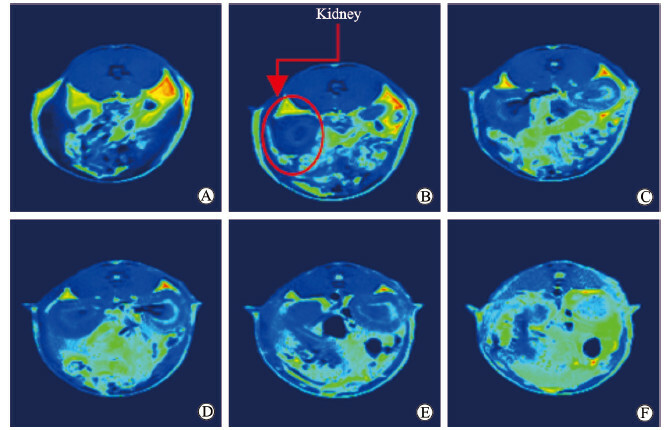 Pearson correlation analysis was used to analyze the correlation between the kidney volume measured by MRI and anatomical volume after dissection, kidney mass, the ratio of kidney mass to body mass, renal function indexes and cyst index. Results The kidney of Han:SPRD rats was clearly observed with low field MRI. 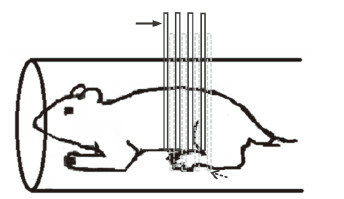 The kidney volumes of 15 rats measured by MRI were 1.51, 1.77, 3.54, 6.45, 9.34, 9.38, 3.72, 9.51, 4.95, 5.31, 6.47, 7.01, 5.39, 5.08, and 7.31 cm3, respectively. The anatomical volumes after dissection were 1.50, 1.70, 2.90, 5.00, 7.00, 7.02, 2.50, 7.10, 4.70, 4.90, 6.50, 6.70, 4.20, 4.90, and 7.00 cm3, respectively. The renal volume measured by MRI was highly correlated with the anatomical volume after dissection, kidney mass and the ratio of kidney mass to body mass (goodness of fit[R2] was 0.903 1, 0.912 8 and 0.777 9, respectively), and was also positively correlated with serum creatinine, urea nitrogen and cyst index (correlation coefficients were 0.86, 0.85 and 0.61, respectively). Conclusion Low field MRI can be used to measure kidney volume of polycystic kidney disease rat models in vivo, providing a reference for the basic research of polycystic kidney disease.